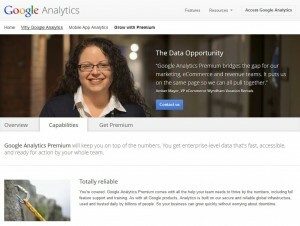 Get all of Google Analytics Premium for one flat annual fee of $150,000. (We like to keep things simple.) That includes all the powerful tools your team needs to embrace the evolutionary speed of marketing and web analytics. It also includes full support and all the security and reliability of Google. We’ve lowered the barrier to enterprise analytics. Because the best numbers shouldn’t be just for those with the biggest pockets. After reading the title and the first sentence I had to double check it to let it sink in. I mean, I know there are probably a lot of useful data tools for a large enterprise company, but doesn’t it seem a little ridiculous?